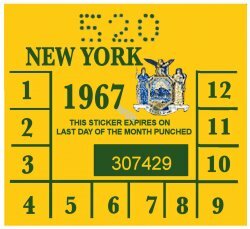 1967 New York INSPECTION Sticker - $20.00 : Bob Hoyts Classic Inspection Stickers, Add a Final Touch to your Restoration! This 1967 New York Inspection sticker has been restored and reproduced precisely identical front, back, size and color to the original. It has our patented "Peel and Stick" format which allows the sticker to be fastened to the inside of your windshield. 1967 and the 1968 stickers were the only years NY state placed the sticker on the upper center of the window near the rear view mirror on the inside. Don't be fooled by people trying to copy our stickers and selling them with blank backs.